Arthur Edward R Ricketts was born in Yeovil in the autumn of 1894. He was the youngest son of glove manufacturer and publican William Ricketts (1857-1921) and his first wife Lucy Sophia nee Dade (1856-1907). In the 1901 census the family were living above the Duke of Wellington in Sherborne Road; William and Lucy together with their eight Yeovil-born children - Emily (b1881), William (b1882), Ada (b1885), Ernest (b1886), Albert (b1888), Frank (b1889), Lily (b1891), Arthur and Ivy (b1896). By the time of the 1911 census the family had moved to Beaumont House, 178 Sherborne Road. William gave his occupation as a glove manufacturer and all four sons were listed as glovers - presumably working for their father. William was a partner in the glove manufacturing company of Hawkins, Jesty & Ricketts Ltd with a factory in Higher Kingston. Arthur initially enlisted in Yeovil, joining the Somerset Light Infantry, Service Number 23024, but was soon transferred to the 7th (Service) Battalion, Duke of Cornwall's Light Infantry with the new Service Number 27614, probably during the early spring of 1916. This battalion had been raised in September 1914 and came under command of 61st Brigade in 20th (Light) Division. It landed at Boulogne on 25 July 1915. Arthur was sent to the front, probably during the summer of 1916. It is not known exactly where Arthur fought during his time with the 7th Battalion although it is known that they were involved in the German retreat to the Hindenburg Line. The Battle of Langemarck from 16–18 August 1917, in which the 7th Battalion, Duke of Cornwall's Light Infantry - almost certainly including Arthur Ricketts - took part, was the second Allied general attack of the Third Battle of Ypres. The battle took place near Ypres in Belgian Flanders on the Western Front. The Allied attack succeeded in the north, from Langemarck to Drie Grachten ("Three Canals") but early advances in the south on the Gheluvelt Plateau were forced back by powerful German counter-attacks. Both sides were hampered by rain, which had a greater effect on the British who occupied lower-lying areas and advanced onto ground which had been frequently and severely bombarded. The Battle of Polygon Wood, 25-27 September 1917, was part of the wider Third Battle of Ypres. It came during the second phase of the battle, in which General Herbert Plumer’s Second Army was given the lead. Plumer replaced the ambitious general assaults that had begun the battle with a series of small attacks with limited objectives – his “bite and hold” plan. These attacks involved a long artillery bombardment followed by an attack on a narrow front (2,000 yards wide at Polygon Wood). The attacks were led by lines of skirmishers, followed by small infantry groups. German strong points were to be outflanked rather than assaulted. Each advance would stop after it had moved forward 1,000-1,500 yards. Preparations were then made to fight off any German counterattack. The attack on Polygon Wood was the second of Plumer’s “bite and hold” attacks, after Menin Road. It was carried out chiefly by the 4th and 5th Australian Divisions but the 7th Battalion, Duke of Cornwall's also played a part. The site of Polygon Wood was captured on 26 September, the target line on 27 September. The attack then stopped, and Plumer prepared for the next attack. The two Australian divisions lost 5,471 men during the Battle of Polygon Wood. The three “bite and hold” attacks brought the front line to the foot of the Passchendaele Ridge, which would be come the target of the First and Second Battles of Passchendaele, and give its name to the entire battle. Sir Douglas Haig described the object of the Cambrai Operations as the gaining of a 'local success by a sudden attack at a point where the enemy did not expect it' and to some extent they succeeded. The proposed method of assault was new, with no preliminary artillery bombardment. Instead, tanks would be used to break through the German wire, with the infantry following under the cover of smoke barrages. The attack began early in the morning of 20 November 1917 and initial advances were remarkable. However for the Allies the results of the battle were ultimately disappointing although valuable lessons were learnt about new strategies and tactical approaches to fighting. The Germans had also discovered that their fixed lines of defence, no matter how well prepared, were vulnerable. Arthur Ricketts was mortally wounded on the battlefield and died in a casualty clearing station, or field hospital, later that day, 20 November 1917. He was just 23 years old. In its edition of 30 November 1917 the Western Gazette reported "My sympathy will be felt with Mr Ricketts of Beaumont House, Sherborne Road in the loss of his youngest son, Private Arthur Ricketts of the Duke of Cornwall’s Light Infantry. Deceased was seriously wounded on the battlefield in France and succumbed to his injuries in hospital. Two more of Mr Ricketts sons are suffering from wounds or injuries. Private Frank Ricketts, the fourth son, who is married, and whose home is in St Michael’s Avenue is in hospital suffering from shrapnel wounds, nerve shock and trench feet. Private A (“Bert”) Ricketts is suffering from injuries sustained to his knee in an accident, and is in hospital in England. He is in the R.F.C. (Royal Flying Corps) and is married, his wife residing in Lyde Road." Arthur was interred in Rocquigny-Equancourt Road British Cemetery, Manancourt. Grave II.B.2. and his name is inscribed on the War Memorial in the Borough. 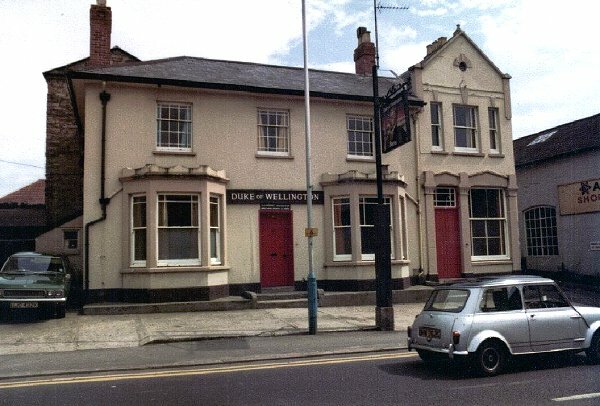 The Duke of Wellington where the Ricketts family lived during the 1890s. 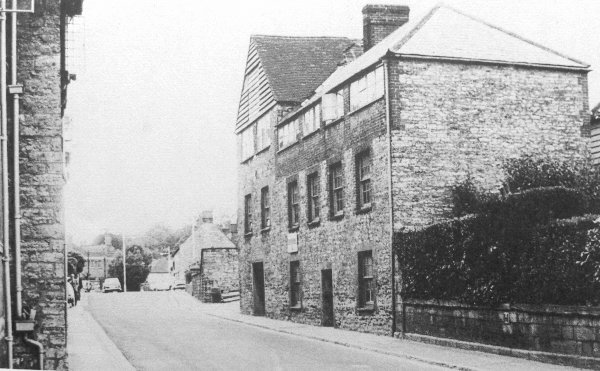 This photograph of about 1965 shows Hawkins, Jesty & Ricketts' glove factory in Higher Kingston, on the north side of the road opposite Kingston Manor House. It is most likely that Arthur and his brothers worked here for their father. 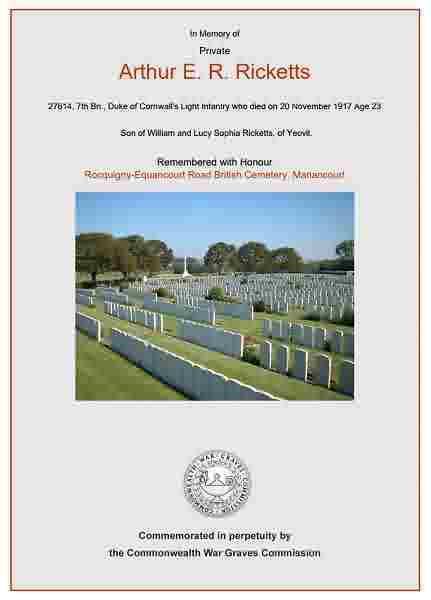 The Commonwealth War Graves Commission certificate in memory of Arthur Ricketts.